Over the years I served as secretary, I enjoyed the opportunity to look through the archives and records of the Lethbridge and District Horticultural Society. Historical records show that for over 100 years now, the society has made significant contributions to the development of the city. In the early years, there was a lot of collaboration with city departments on the “greening” of the city: planting boulevard trees, creating parks, etc. As more residents became interested in beautifying their own properties, society members provided horticultural advice at the monthly meetings and through educational columns in the Lethbridge Herald. The annual Flower and Vegetable Shows brought together city gardeners, to show and share their horticultural successes. I came to appreciate what the society was all about and to respect the contributions of many members over many years. The society was also a social organization of passionate gardeners in a time when people made the time to enjoy hobbies and to volunteer in their community. In these days of Google and the Internet, gardening information may be more readily available but they will never replace the personal connections with other local gardeners. Another unfortunate sign of the times is that many volunteer endeavors suffer from lack of participation. The society continues to have many rewarding volunteer opportunities and, in the spirit of the society, I encourage you to stay involved. As treasurer, I learned that previous boards made an ongoing effort to raise funds for a future major garden project. The original idea of building a conservatory faded with the reality of the establishment and ongoing operational costs, at a time when society membership was declining. But the funds have continued to grow slowly but steadily, and the dream has never completely died. In the last 6 – 8 years, the opportunity to develop a special garden project coincided with the presence of a dynamic board of directors, with a vision and commitment to create an ornamental garden to share with city residents and visitors. There have been delays, but the Legacy Ornamental Garden Planning Committee is continuing to make progress. And they could use your help with flowerbed design ideas, fundraising, and hopefully, gardening tasks in the spring. This garden will benefit from the ongoing support of gardeners, sharing their passion and experience with visitors to the garden. When I think of the Legacy Ornamental Garden, I see it as a legacy to the generations of gardeners who have contributed to the horticultural beautification of Lethbridge and to the generations of society members who established and contributed to the fund to keep the dream alive. Thank you all for your friendship and support over the last 14 years and the lovely gift. gardens. We also have a welcome back BBQ and Pot Luck, which is also included. Paul Stevenson was named 2017 Gardener of the Year at the regular Horticultural Society meeting May 28. Paul was cited for his hard work toward planning for the Legacy Garden project, scheduled to start this summer. head was full, and he couldn’t learn anything more. Our Gardener of the Year could say the same. Although she has a doctoral degree in medicine, she continues to engage in educational activities, and recently earned the Prairie Horticulture Certificate from Olds College. She also puts in a vegetable garden every year, and particularly enjoys growing cherry tomatoes, potatoes and winter squash. Along with her husband, she also grows vegetables for the food bank. When I first heard about that contribution, they were growing 1200 pounds of potatoes to give away. Although she says the volume is not what it used to be, but they still make an annual contribution – mostly onions the last few years. Her biggest interest in the flower garden right now is the herbaceous peony. She has started hundreds of seeds since first buying them from the Canadian Peony Society seed exchange in 2010. Now she also uses the American Peony Society seed exchange as a source. Her primary interest is in the herbaceous hybrids (interspecies crosses of herbaceous peonies) and single red lactifloras. She has had some of her seedlings bloom for the first time already, and is expecting more this spring. We will watch for the commercial release of some of her hybrids. Maybe she’ll name something after us. Another of her interests is alpine flowering plants for the garden. She has successfully grown several alpine perennials that are said not to be hardy in our climate. Her main source of seed for the alpines is the seed exchange held by the North American Rock Garden Society. To see some of the public spaces she has contributed to, visit three of the gardens the Hort Society continues to develop and maintain. First, she was one the few (four or five) people who developed the native plant garden at the Galt Museum & Archives, where she contributed not only physical labour, but also the native seedlings she had grown. She has also been the driving force behind the rehabilitation of the flowerbeds on the north side of Henderson Lake. Her commitment there includes planning the beds, growing plants, purchasing shrubs, arranging for work bees, establishing and maintaining contacts with the city, and actually doing the physical work. Finally, she is the person behind the Hort Society’s involvement in the Hospital Beautification Project. She has been our contact person there, she makes the decisions on the annuals to plant every year, and, as usual, she does a lot of the physical work. If all this isn’t enough, she contributes further to gardening in the city by her commitment to the Hort Society as one of our directors. The Galt Museum & Archives is looking for a volunteer to collect seeds from the Native Prairie Plants Garden. The Seed Program collects, cleans and packages the seeds and then sells them in the Museum Store. The program is mainly volunteer run. It is an easy job and not terribly time-consuming. Someone will call you to let you know when it needs to be done and what seeds to collect. At times it may be two or three times a week during the peak collecting season, for perhaps an hour or so at a time. At other times, it’s maybe once a week or less. All supplies and training are provided. If you are interested in helping, please call Beatrice at the Museum at 403-320-3154. 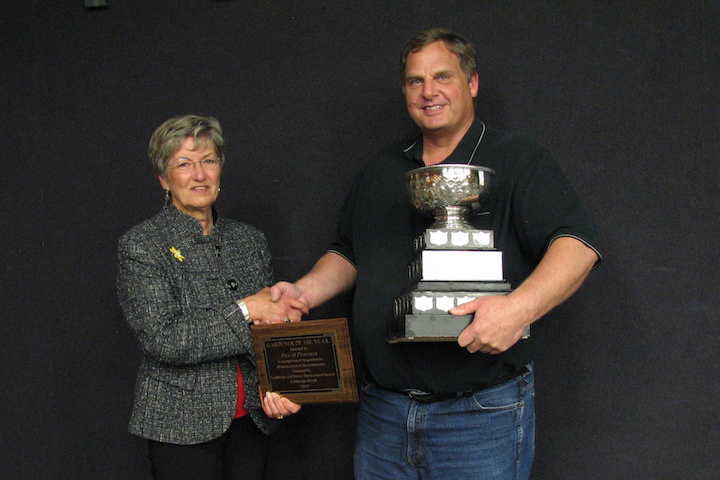 On April 25, Dave Pearson was awarded the Lethbridge Herald / Lethbridge and District Horticultural Society Gardener of the Year Trophy in recognition of his promotion of horticulture in the community. Dave served 15 years as a director of the Horticultural Society taking a leading role in organizing the annual flower shows. Since 2004 he has volunteered with the Friends of the Fairfield Gardens Society. His interest in growing edibles contributed to the establishment of the PSAC Food Banks Garden in 2010 and, in 2013, he was instrumental in the building of the Interfaith Food Bank Learning Garden. His volunteer contributions now extend to the Community Garden Project at the Boys and Girls Club. Although Dave humbly credits his fellow volunteers with the success of these community-based gardening projects, his leadership, expertise and hard work make him a most deserving “Gardener of the Year”. Congratulations Dave. If you are willing to open your garden to be viewed at a time that is convenient to you, or when a particular display is looking great, give our president, Penny Dodd, (403-380-3809) a call; we’ll get the word out to members. As an incentive this year we will offer a one year membership up to $25 plus a $20 gift certificate for the effort the home owners make in opening their garden to members. The Board would like to form a committee to look at possible projects for Canada’s 150 birthday. retailers reserve the right to limit or withdraw this offer without notice. If you have any questions, please contact the Society Treasurer. • Coaldale Nurseries 10% off purchases. Trees and shrubs only. • Country Blooms Garden Centre 10% off purchases. Discount does not apply to Gift Shop items. • Green Haven Garden Centre 10% off purchases. Available year-round. Not to be used with other promotional discounts. • Home Hardware – West Lethbridge 10% off purchases. Discount applies to seasonal garden items only. Inquire before purchase. • Shaughnessy Greenhouse 10% off purchases. • Hilltop Greenhouses at Monarch 10% off purchases. Thank you for supporting these local businesses.